I recently had a chance to catch up with Steve Daniels, founder of the Better World by Design Conference and author of the fascinating Making Do. I’m sure you’ll find Makeshift, his new project, as intriguing as I did. I seriously can’t wait to get my hands on Issue 1. Francisco Noguera, NextBillion.net: Tell us a bit a bit about your latest project, Makeshift. How did the idea come about and how would you describe the topic area of the publication? Daniels: Makeshift is a quarterly magazine and multimedia website about grassroots creativity and invention around the world, with a particular focus on resource-constrained areas. We have contributors in over 20 countries in search of stories of street-level ingenuity. This magazine was inspired by my experiences in Nairobi, where I arrived several years ago with designs for farming tools for an NGO. When I tried to figure out how to get these tools manufactured, I found myself in industrial slums where many of the problems we struggled with in the lab had already been solved. Local engineers, known as jua kali, were sourcing and working with local materials, designing for flexible fabrication, and marketing and distributing their products around the country at a profit. 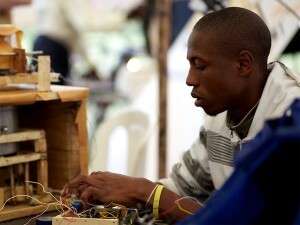 It was clear to me that these creative and driven makers must be leveraged towards industrialization. I stayed for three months to learn more about the jua kali and wrote a book called Making Do: Innovation in Kenya’s Informal Economy, which is online for free. It turns out that this type of creativity exists in cities all over the world, especially where resources are scarce. Grassroots invention goes by different names in different cultures: DIY in the US, jugaad in India, gambiarra in Brazil. Someone emailed me the other day to tell me it’s leshabzer in Israel. Makeshift seeks to unify these disconnected identities into a global movement of makers. NextBillion.net: Can you give us a taste of what a Makeshift story will be? Tell us your favorite story. Daniels: There’s an inventor in China named Wu Yulu. Previously a rural farmer outside of Beijing, he now devotes his time to his obsession with robotics. 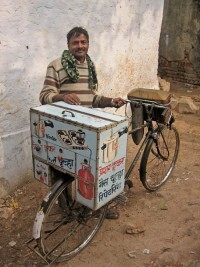 He has created dozens of robots he call his “sons”, from fanciful biomimetic creations to practical tools, such as his rickshaw and corn husker bots. He makes these robots with just scrap parts and a fifth grade education. After years of tribulations, including driving his family into debt and burning his house down, his luck turned when he was invited to showcase his work at the Shanghai World Expo. He now sells his robots and consults with universities. It’s this type of resourceful problem-solving in back alleys and garages that should be promoted and leveraged towards economic development. NextBillion.net: What is your vision for Makeshift a year from now? Five years? Daniels: We’re releasing the first issue at the end of this month at the Better World by Design conference. By Issue Three I want to be financially sustainable and start producing a sister publication-a complementary booklet of practical tips for makers. Eventually I want to expand distribution globally, especially to the developing world and start localizing some of the content. We’re partnering with the Maker Faire Africa (Pictured left) to start distributing to makers in the developing world from Issue One. NextBillion.net: How can NextBillion readers contribute to the project? Daniels: NextBillion readers see great potential at the base of the pyramid, a perspective we champion at Makeshift. We could use your support in spreading the word and backing our Kickstarter campaign in exchange for rad prizes, including a trip to Mexico City to work on a story in Mexico’s largest black market. Get in touch with us if you’d like to contribute to Makeshift or come across any examples of makeshift design locally or in your travels.